This Dec. 8, 2018, file photo, shows the Bastille Metro station in Paris, France. Paris police said a man on the city's subway was seriously injured Friday after being burned with an "unknown liquid" in what French media have described as an acid attack. Paris prosecutors' office said an investigation for attempted murder has been opened. 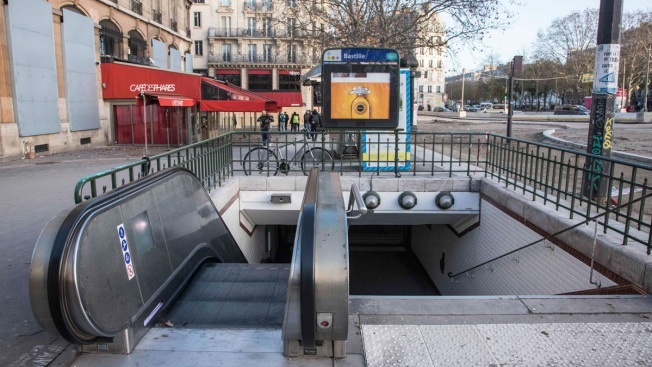 The unidentified victim was attacked in the metro's line one, near the station of Bastille, during rush hour Friday morning. The person is being treated for major burns to the face and hands after being evacuated by the emergency services. Police said the perpetrator is at large. On Wednesday, a man and a woman were burned by an "unknown liquid" spread on a seat and floor in the metro but police said there was no link. In Sept 2017, two American college students were injured in a hydrochloric acid attack by a woman at a train station Marseille, southern France.